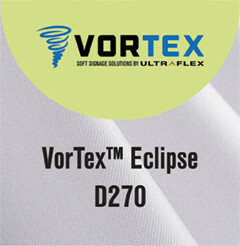 VorTex Eclipse D270 is a 8 ounce knitted polyester fabric with a black-back. Designed for direct dye-sublimation, Latex and UV print processes. Soft drape, excellent flexibility and a slight stretch in each direction. Ideal for SEG frame systems.